Every Monday, after daily mass, the parish says a novena to Our Lady of the Miraculous Medal. 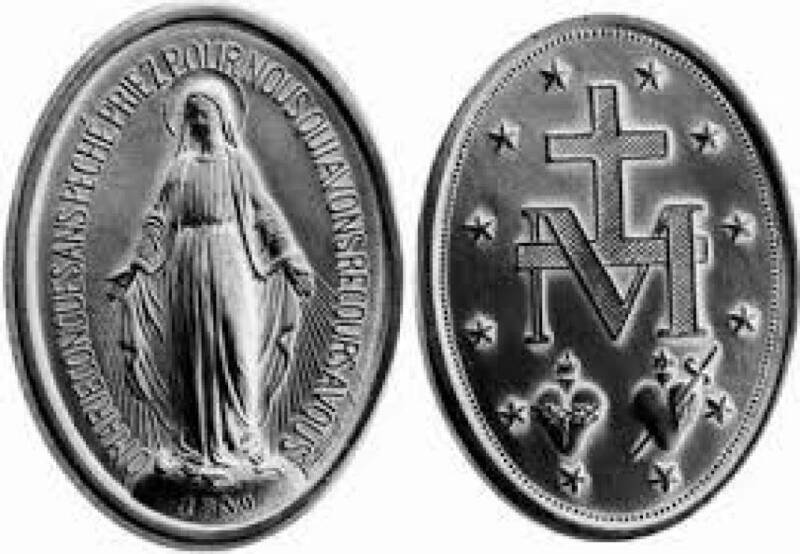 The Miraculous Medal was given to Saint Catherine Labouré, a sister in the community of the Daughters of Charity, by Mary during three Apparitions. The Association of the Miraculous Medal offers a more detailed account of the story that can be read by clicking here. O God who did instruct the hearts of the faithful by the light of the Holy Spirit, grant us in the same spirit to be truly wise and ever to rejoice in His consolation, through Jesus Christ Our Lord. O Mary, conceived without sin. -Pray for us who have recourse to you. O Lord Jesus Christ, who have vouchsafed to glorify by numberless miracles the Blessed Virgin Mary, Immaculate from the first moment of her conception, grant that all who devoutly implore her protection on earth, may eternally enjoy Your presence in heaven, who, with the Father and Holy Spirit, live and reign, God, for ever and ever. O Lord Jesus Christ, who for the accomplishment of Your greatest works, have chosen the weak things of the world, that no flesh may glory in Your sight; and who for a better and more widely diffused belief in the Immaculate Conception of Your Mother, have wished that the Miraculous Medal be manifested to Saint Catherine Labouré, grant, we beseech You, that filled with like humility, we may glorify this mystery by word and work. Remember, O most compassionate Virgin Mary, that never was it known that anyone who fled to your protection, implored your assistance, or sought your intercession, was left unaided. Inspired with this confidence, we fly unto you, O Virgin of Virgins, our Mother. To you we come; before you we kneel sinful and sorrowful. O Mother of the Word Incarnate, despise not our petitions, but in your clemency hear and answer them." O Immaculate Virgin Mary, Mother of Our Lord Jesus and Mother, penetrated with the most lively confidence in your all-powerful and never failing intercession, manifested so often though the Miraculous Medal. We, your loving and trustful children, implore you to obtain for us the graces and favors we ask during this Novena, if they be beneficial to our immortal souls, and the souls for whom we pray (here privately form your prayer request). You know, O Mary, how often our souls have been the sanctuary of your Son who hates iniquity. Obtain for us then a deep hatred of sin and that purity of heart which will attach us to God alone so that our every thought, word, and deed may tend to His greater glory. Obtain for us also a spirit of prayer and self-denial that we may recover by penance what we have lost by sin and at length attain to that blessed abode where you are the Queen of angels and of all men. O Virgin Mother of God, Mary Immaculate, we dedicate and consecrate ourselves to you under the title of Our Lady of the Miraculous Medal. May this Medal be for each one of us a sure sign of your affection for us and a constant reminder of our duties toward you. Ever while wearing it, may we be blessed by your loving protection and preserved in the grace of your Son. O most powerful Virgin, Mother of our Savior, keep us close to you ever moment of our lives. Obtain for us, your children, the grace of a happy death; so that in union with you, we may enjoy the bliss of heaven forever.